That time of the week again for another book review! Synopsis: Wade is a poor boy, living in the stacks with his ungrateful aunt who only has him around for the food the government gives her for him. The only good in his life is the online world, the OASIS, where he spends most of his time. There is also a little contest that has been in effect for years, a contest that could change Wades life forever if he were to win. The contest consist of finding three keys hidden in the OASIS by one of the developers. In a moment of luck Wad finally figures out where the first key is and he becomes the first player to find the first clue. Now, there are people that want his help and others that want him dead. All for a chance to become the new owners of the deceased developers company and his fortune that comes with winning the contest. Review: Warning: This review can and most likely will include spoilers. Should you want to avoid the spoilers, skip on down to the conclusion where it is safe. Our world has become the age of computers and internet and in Ready Player One we may be seeing the future. This could be what our world is coming to and it’s rather exciting if I do say so myself. Wade is a underprivliged teen who finds comfort in the virtural reality world. He has studied everything from the 80’s just to have a heads up on the contest that, if won, could lead him to being the next person to control the OASIS. He spends every moment studying and looking for the first key, or at least every moment he is not in school. He hides in an old van where no one can find him, away from his home life. In the OASIS wade is known as Parzival and he soon becomes one of the most famous players. Then a new company, who wants to control OASIS confronts Wade, they know who he really is, and they are willing to kill him to keep him from winning the contest. Between him and his friends he fights to concur the contest. I am so in love with this story. This kid goes from being some random nobody kid to a leader. In the end he leads the whole lot of people in the OASIS into a battle against IOI, a company who wants the OASIS for themselves so they can charge people more for using it. And then there is the love story between Wade and his crush Art3mis. She is probably smarter than Wade, she knows more about the 80’s than he does. She figures out most of the clues before him, he was just quicker at making it to the first key. There is a short little love story that she breaks off because she wants to focus on the contest. The whole time I was shouting at Wade, Art3mis and Wade’s best friend, Aech, to just join together and figure it out. There was so much money to win that there would have been no issues splitting it! Which, in the end they did and it was amazing. My favorite part of the novel was the final battle. It was so intense that I almost tore the book because I was holding on to it so hard! Conclusion: This book is the perfect book for any nerd. I am so mad that I didn’t know anything about it until this year, when my brother got it in a subscription box. It is a story about finding comfort in a virtual world, something a lot of us do, but then realizing that reality can be so much better. It is about a boy, coming out of his shell and becoming a leader, stepping into a role he was meant to be in. It’s about friendship and hard work. I loved this book so much, even if it did take me a little longer to read. It does start off a little slow, but that was my only problem. Let’s talk about the cover though! At first I didn’t like the cover, but now I am in love with it. I tried to imagine what the stacks would be like, it took me a minute to realize that was what the cover was. It was Wade climbing up the stacks to his aunts trailer. It’s a crazy idea that people were living on top of each other. If you have not read this book, please do before the movie comes out. I am so looking forward to seeing how the movie turns out! 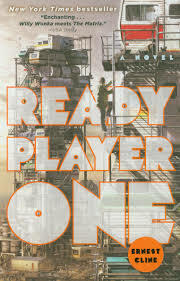 Have you read Ready Player One? What did you think about it?